I have emphysema and use an Anoro Ellipta inhaler. Any suggestions on improving my lungs? Are there any natural or home remedies that can actually reverse this disease? Hi Ed, and thanks for your question regarding natural ways to improve lung capacity from COPD (Chronic Obstructive Pulmonary Disease). There are certainly some excellent natural and home remedies for COPD and emphysema. Not only can some of these help you to breathe easier by removing the mucous build up, they can even reverse this awful condition. 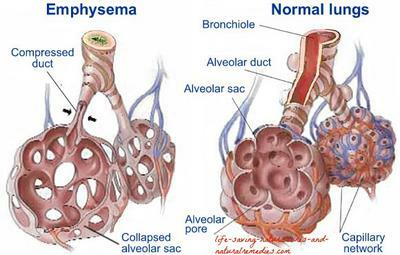 Natural Treatment for Emphysema #1... Cannabis Oil: Medical marijuana, cannabis oil, help oil, whatever you want to call it, is the absolute best remedy for COPD and emphysema hands down! So many sufferers have found astonishing relief with this treatment (just do a quick Google search and you'll see). I would recommend you have a read of this terrific article by my good friend, Paul Fassa, on the benefits of cannabis oil for COPD... Man Uses Cannabis Oil to Successfully Treat Another Incurable Disease – COPD. Also, take the time to have a look at some of these powerful video's and documentaries from YouTube on the use of medical marijuana for strengthening the lungs and reversing COPD... youtube.com. In one study, researchers studied 50 COPD patients and randomly assigned them to receive either a monthly dose of vitamin D3 or a placebo. Patients receiving the vitamin D were given 3,300 IU's (international units) per day (measured into a monthly dose) which is way above the pathetic U.S. recommended daily allowance of 600 IU's a day. All of the patients participated in a pulmonary rehabilitation program for three months in which scientists measured peripheral and respiratory muscle strength, exercise capacity and vitamin D levels. This was done at the beginning of the rehabilitation and once again at the conclusion. The results showed the patients treated with vitamin D had a big improvement in exercise capacity and respiratory muscle strength compared to the placebo group. "These results support the idea that correcting vitamin D deficiency by adding vitamin D supplements to training programs allows COPD patients to achieve better results from rehabilitation, including improvements in muscle strength and exercise capacity," one of the researchers said after the study. 1. So be sure to start taking AT LEAST 3,500 IU's (preferably around 5,000 IU's for best results) of vitamin D3 per day, and get out in the sun! “clear” and it prevents micro-organisms from growing easily. With regular SSKI use, bronchial infection is a much less frequent happening. Depending on the severity of COPD, I recommend 3 to 6 drops of SSKI taken in water once daily. As COPD is usually a chronic condition, SSKI use will usually be indefinite, so make sure to monitor your thyroid function! 2. He talks about using the drops but if you can't get hold of them you can still use the high potency capsules such as these... Pure Potassium Iodide. Just follow the directions on the bottle for use. Home Remedy for COPD #4... Bromelain: Bromelain is a nutritional supplement made from the enzymes found in pineapples. It can help with COPD relief as it reduces inflammation in the body (including the lungs). Researchers from the Health Sciences Center at the State University of New York recently reviewed a collection of supplements for COPD and said that bromelain is safe to try. A daily dosage is in the range of 80 to 500 milligrams. Of course you should avoid bromelain if you're allergic to pineapples. Natural Treatment for Emphysema #5... Hydrogen Peroxide (H2O2): The hydrogen peroxide inhalation therapy is also a very powerful - and dirt cheap remedy for emphysema. In fact, it works so well that you’ll usually start to feel better and be breathing easier in a few hours! It really works that fast. What the hydrogen peroxide does is “oxygenates” the lungs. And of course, more oxygen in the lungs means much better and easier breathing. Thankfully, this treatment is now even being recommended to COPD patients by many medical practitioners. The Hydrogen Peroxide Inhalation Method. It explains it all very simply. And make sure you ONLY use 3% food grade hydrogen peroxide (like this one). Do not use the 35% industrial solution. In addition to this, you can also use the salt therapy (salt pipe) for emphysema and COPD. This remedy was first discovered in Central Europe, where sufferers of COPD would go into salt caves or salt mines and breathe in the salt air. This "natural salt air" worked wonders for their symptoms. Now you can buy devices known as salt pipes and use these to breathe in Himalayan pink rock salt (a very healthy and pure form of crystal salt) at home. This practice works like a charm too! Here's what salt pipes look like if you're interested... Himalayan Salt Inhaler. Natural Remedy for COPD #6... Eat Healthy and Quit Smoking: These two go without saying. Smoking is the main cause of emphysema and COPD so the cancer sticks have gotta go if they haven't already. And eating plenty of fresh fruits, vegetables, herbs, seeds and grains will definitely go along way to cleaning and detoxing the lungs and other bodily organs, so be sure to eat these by the truckloads. And don't forget to throw in 30-40 minutes a day of moderate exercise just for good measure! Hope this helps you Ed. P.S. For more extra tips and remedies on getting those lungs healthy, be sure to have a read of our informative "asthma remedies" article as well. Here's the link... A Home Remedy for Asthma That Works Every Time! I just want to say Thank You very much for your time invested and caring attitude. To say I'm surprised would be a huge understatement. Your suggestions have given me new hope! I will start to implement them all. Medical marijuana is not legal in S.C. yet. When it is legal I will try if not expensive. I didn't understand this statement?... Patients receiving the vitamin D were given 3,300 IU's (international units) per day (measured into a monthly dose) Should I take 3,300 a day? Again I want you to know how much I appreciate your kindness. I have already sent your site to my friends & family. Age 72 looking for 73.This will help! Hi Ed. Firstly, you're very welcome. Glad we could be of service. These remedies will definitely help so you should be full of hope! Now, with the vitamin D, yes it's 3,300 IU's per day but this is the minimum. Many vitamin D3 supplements now come in 5,000 IU capsules and these are the ones you want to take. 5,000 IU's per day of vitamin D is not harmful, it's actually very healthy! According to world-renowned vitamin D expert, Dr Cedric Garland, this is the amount we all SHOULD be taking every day anyway, so I suggest following his advice. You'll definitely feel much better for it. Thank you so much! I just sent you a question about COPD and now I found the answer. My husband has chronic COPD and I am going to try all these natural remedies. Thanks for the info and education on all your articles! You're very welcome Grace. Hope they help. I need help. My last blood test showed I might have lupus and my doctor has referred me to a rheumatologist. I do not want to take any drugs if I can heal myself with natural medicine. Please help me. I am really afraid as I understand this is a hard and mean disease. Hi Grace. Have a read of this recent Q&A on the top 7 natural remedies for treating lupus... 7 Natural Remedies for Lupus That Give Proven Results! For best results, use all 7 in combination with each other and be sure to follow a healthy "clean eating" diet. Troy, thank you so much for taking the time to answer my question. I will try all of these natural remedies. I have also already changed my diet eating 70% vegetables and juicing. You are a true blessing from heaven to all of us who desperately need help. May God continue to use you in this field! Blessings! How do you stop the hard coughing? What home cure can help with this and get rid of the white phlegm? How can the lungs return back to normal at 64? Both the potassium iodide (SSKI) and the hydrogen peroxide inhalation method (#3 & #5 remedies) are excellent for removing the awful phlegm and healing the lungs. They both work a treat! Organic apple cider vinegar with the "mother" (like this one) is also terrific for removing phlegm from the lungs. Simply add two tablespoons (30 ml's) of organic apple cider vinegar to a glass of clean filtered water (add a teaspoon of natural honey for taste if need be) and drink down. Drink this concoction twice daily on an empty stomach, particularly just before you go to bed. You'll notice a big difference within a few days.